Okay, so it's approximately seven days before Halloween (five if you're celebrating over the weekend)—what's your costume status? Have you been planning an awesome outfit for months? Did you come up with a solid plan a little over a week ago? Or are you like some of us here at Byrdie HQ who have no idea what on earth we're going to be yet? If you can relate mostly to the latter, we've got some great costume inspo that only involves a few components: black and white paint and a small makeup brush. And since Halloween face paint is so cheap, you won't have to fork over a pretty penny for one of those pre-made Halloween costumes. Dear readers, behold the half-skeleton. 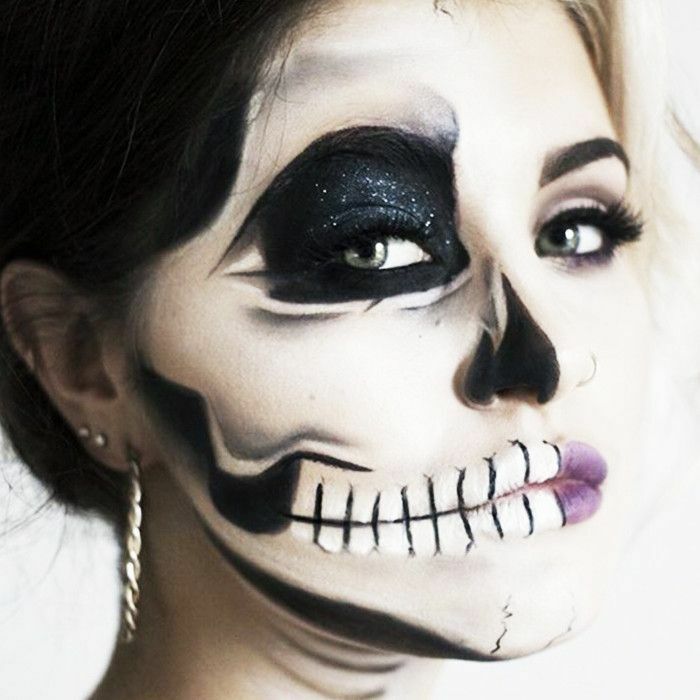 This look is trending, so in order to avoid having the exact same look as every other half-skeleton out there (a sentence we'd never thought we'd write until now), we've rounded up some breathtaking looks from YouTubers that you can take notes from and put your spin on (because this is Halloween, after all—time to get crafty!). Take a look at our favorite half-skeleton looks below. Are you still on the fence about what you'd like to be this year? Tell us what you're thinking of being in the comments, and keep checking back on Byrdie.com for more inspiration!